Posted on November 9, 2011, in Reviews and tagged Avengers, Cosmic, Gamora, Jim Starlin, Marvel Two-In-One, Steve Leialoha, Strange Tales, Thanos, the Magus, Warlock. Bookmark the permalink. 30 Comments. Yes! What a great saga. Glad to see it reviewed here. Starlin was just warming up for this one on Captain Marvel. The struggle against the Church/Magus is the best part, but we love that resolution at the end. And, you can consider this story a warm-up for Metamorphosis Odyssey where, freed from any and all super-hero or continuity muck, Starlin knocks it out of the park. We’ve read this story dozens of times so forgive us for pointing out: Thanos allied with Warlock because, for all his evil, the Magus was a force for Life. Starlin makes it clear that Magus was a jerk, but he had Purpose. Magus would have grown so powerful as to easily defeat Thanos, who was a force for Death. 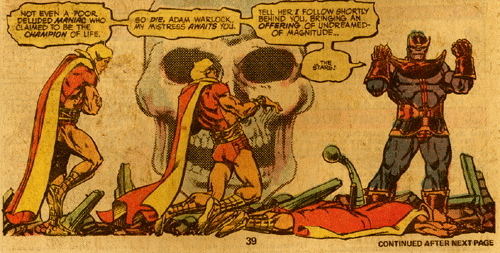 The In-Betweener tells Adam, “Life has need of a champion to defend itself against… a powerful advocate of death. The Magus, strange as it may seem to you, is to be the champion of life!” In ‘helping’ Adam, Thanos only sought to defeat the last hope for Life in the universe: the Magus. Starlin went beyond the easy good guy/bad guy division here for a deeper interpretation of the duality of the forces of Life, also seen in his use of Chaos, Order, and The In-Betweener as characters. One of our favorite stories of all time, and more influential on our philosophy than many philosophy books out there. Thanks, as always, Mars, for reading and commenting. And thanks for pointing out the convoluted enemy-of-my-enemy motivation that put Warlock and Thanos on the same side, if just for awhile. For all that this was an outer space comic book epic that rationale shows some very 1970s-era Cold War bipolar thinking (entirely appropriate, given that these tales are from 1975). 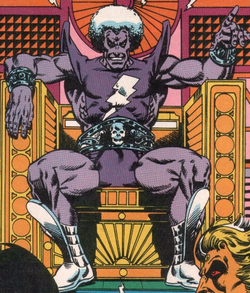 Now that I’ve re-read and reviewed both Captain Marvel and Warlock I suppose Dreadstar is an inevitability. I’ll have to dig those issues out the Accumulation the next time I can convince myself to face it, with an eye toward filling in my (many) missing numbers in that run. I sense there’s some Dollar Box treasure to be had there. It’s superficial, I know, but I never really tumbled to Dreadstar because I couldn’t work up a lot of affection for a main character in a hoodie with a blonde goatee — but I recall it had a Cat Head Guy in it, and that forgives many sins. As you can tell, I think deeply about these things. Cat Head Guy is our hero, dude! We’ve been hooked since his origin in #1. Thanks to the glorious recession, most issues of Dreadstar you can get for less than 2 bucks. We see smokin’ deals on complete collections on eBay sometimes, too. Finishing up the Paranoia series rocked. It was creepy and funny at the same time. Good dystopia tale. Issue #6 with the big robot eyeball is on our office wall among our eyeball cover collection. Thank you for that gift! Glad you liked Paranoia … getting those books out of storage to send to you gave me an excuse to read them for the first time in twenty years. And the experience was … not horrible. I even laughed a couple times. 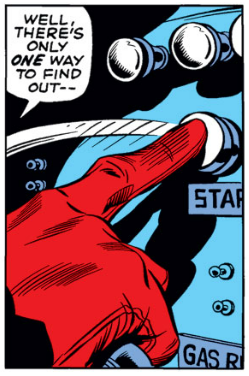 Of course I have the benefit of knowing what is supposed to be going on so I can follow the story despite the attractive but sometimes-incoherent art. I’ll blog about it someday. In the meantime, maybe we should collaborate on a Top Ten Cat Headed Guys in comics list. We’ve already got Wildcat and Oedi … who’s next? Does Catwoman count as a “guy” in this context? Weighty issues demanding due deliberation! Make it real tough and feature only cat-headed people actually in our respective collections – no googling! Pretty sure we have ten in the shortboxes: Oedi (and he had a female counterpart later), Wildcat, Black Panther, Hepzibah (Starjammers), Tigorr (and Felicity, Omega Men), Cheetah, Catwoman. There was Jack Kirby one in Kamandi maybe… A cat head freak appears in League of Extraordinary Gentlemen (Dr. Moreau issue.) Plus, hot naked catwomen in Genus. We don’t have anything with Cat Man unless he’s popped up in Crisis, and no Thundercats made the cut in our shortboxes. Surely there is room for Omaha the Cat Dancer, and Tigra? And do we make an animation exemption for Fritz the Cat? Although this is stretching the point — we have left the realm of “Cat Headed Guys” and entered the world of “Anthropomorphic Cats,” where Tom (sans Jerry), Scratchy (nee Itchy), and the Aristocats reign supreme! This is why we love comic book blogging. We’d never heard of Omaha the Cat Dancer before. Looks like a fun series. We see the collected ‘omnibus’ is up on Amazon. If not for bloggers, may of these indie/underground titles would be totally off the radar. I will confess I broke your rules and dredged up Omaha from memory (no copies of that series in my Collection or Accumulation). It only occurred to me because I’ve been reading a little R. Crumb and Omaha seems pretty clearly inspired by his work. This is another example of where the slight age difference between us (I’m 46) is critical in where our tastes lie. My “golden age” is just a little bit later than yours. And the three years I lived overseas (5th, 6th, & 7th grade) means that although comics were a part of my life as a young person, I didn’t begin “serious” organized reading or collecting until the late seventies (me at about 14 or so). So these love letters of yours to early seventies stories, especially the Marvels (I am a DC guy mostly) are fascinating to me, as this is a “blind spot” to me. I have read lot of Golden Age stuff, and a bunch of early Marvel from the sixties. 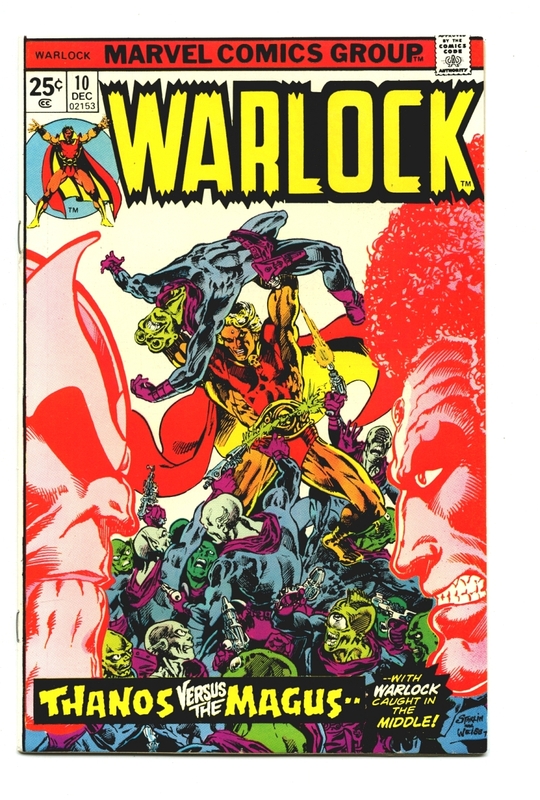 But this era that you keep coming back to, that of books such as Warlock, is bringing to my ayttention books that I never considered picking up or seeking out, ones that were totally off my radar screen. Many of the Marvel books I most esteem trace to the era when Roy Thomas was Editor-In-Chief. An insight I got from Sean Howe’s Marvel Comics: The Untold Story (which I review next week) is that during this time, while Marvel’s most-visible, top-line books received editorial scrutiny, a lot of the lower-selling stuff was off the radar. Sometimes books were so far behind that proofreaders had limited time to go over them, or no time at all. Certain creators also deliberately turned in their work late, or at the very last moment, to reduce the chances they would be asked to re-write or re-work something. Not all of those books are from the Thomas era, but that era set a kind of attitude and framework for the way Marvel would work right up through the Jim Shooter era, when everything became more buttoned-down and centrally-controlled (and, not coincidentally, blander and less memorable). 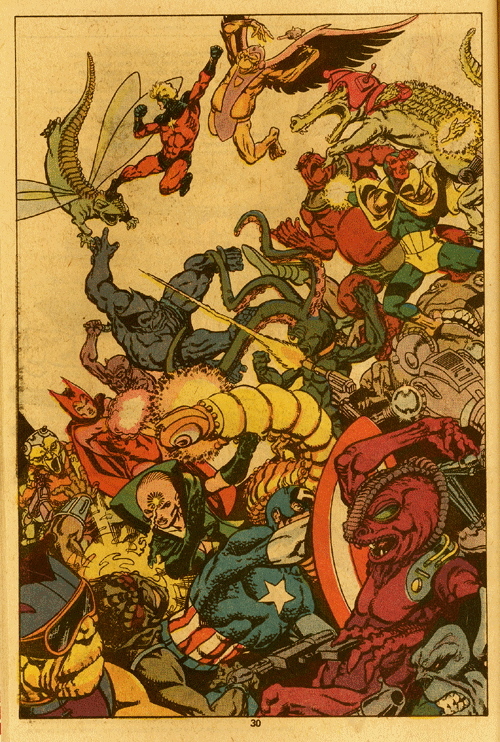 At the time, the 1970s weren’t a great time to be a comics reader (and I should know because I was there) — books were late, or abruptly cancelled, sometimes lurching back to life and then cancelled again. Books went bi-monthly (usually a kiss of death), or had unexpected fill-in issues. Teams changed without rhyme or reason, with new creators deliberately undoing everything their predecessors had accomplished. Plus the paper quality was crap! But … but … there was creativity, and experimentation, and a lot of risk-taking, and from month to month you were never quite sure what you were going to get. All these years later, the delays and the team changes don’t matter so much, because we can cherry-pick just the best of the stuff, or go into a series retrospective (like McGregor & Russell’s Killraven) already knowing that it is going to end in the middle. A lot of the best stuff from that era is now available digitally, or cheaply in the back issue bins (given that Spider-Man or the X-Men don’t figure in most of these books). In a lot of ways, it’s never been a better time to read these old books. It’s a big part of the reason I’m stuck in 1978! My my, aren’t we cynical? 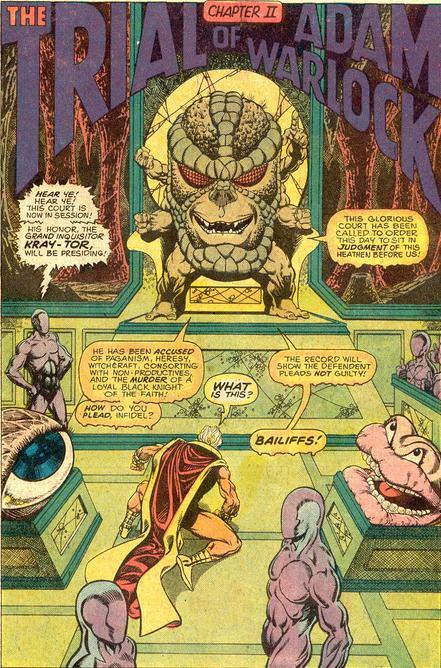 Anyway, the whole “Giant Warlock” thing was resolved in an issue of Marvel Team-Up, by Chris Claremont of all people, so it wasn’t so much “forgotten” as it was dismissed summarily. Here’s me putting in my vote for you to dig through that Graveyard and finding those issues of Dreadstar. I only ever had one or two issues, but as a kid I would have killed for more and am curious how they’d hold up. Since posting this article I’ve actually put together a full run of the Epic Comics Dreadstar (I don’t have the issues after it moved on to … First Comics, I think?). Anyway, it’s in the “to be read” pile. Someday. 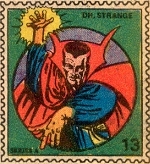 Since Starlin’s Warlock is one of my all-time favorite runs, I have been meaning to comment here since finding your site. But I’m going to zip through that, just saying your analysis is pretty accurate. 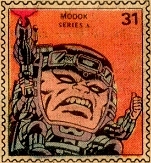 I like to think the series might have ended better (Starlin had other stories planned before killing Warlock off, including an encounter with the High Evolutionary and such) had he not been running into editorial interference that led to his quitting Marvel, at which point the book was cancelled. I have always felt cheated that we didn’t get those stories. His resurrection of the character in the 90s didn’t have anything as good as this run, of course, but I enjoyed some of it. First 15 or so issues of the Infinity Watch series, I guess. I was moved to comment in part because you mention Dreadstar, which I was also a big fan of back in the day. In retrospect, the best issues were early on. Not much to recommend the book from around 13-26, or whatever the last Epic issue was. Jaw dropping numbers of recap pages. BUT, if you do finally read them all, you will need to track down at least the first 3-4 First Comics issues, since those actually finish the story (last Epic issue ends with a real cliffhanger). I personally enjoyed the First run all the way until Starlin left with Issue 40. He was writer only from 31-40 and to me it’s some of his best storytelling, albeit on the grim side. So anyhow, I recommend you track down the First issues from 27-40, or at least 27-30, in your spare time. Enjoy. Thanks for the comment, and your advice on Dreadstar comes at a good time, as I am due to begin the final push on trimming down my Accumulation this weekend, and Dreadstar might have been on the bubble (but not now). 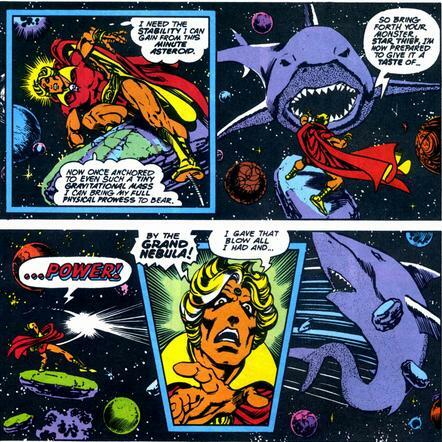 Overall, my feelings on Warlock have mellowed a little bit since writing this review, and you are right, when viewed in the context of that era of Marvel, with all the editorial restrictions and etc., the miracle is that the whole series wasn’t space sharks! That Magus story (and even the Pip sideshow issue) stand up very well — this was passionate and committed work and I expect Marvel’s movie studio will be mining it for decades to come.